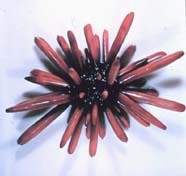 A pencil urchin of the phylum Echinodermata. 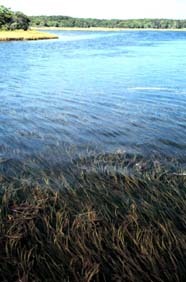 ecological resilience - a measure of resistance to ecological disturbance and the speed of return to the equilibrium state of an ecosystem; also called "ecosystem resilience"
Ectoprocta - an animal phylum synonymous with the phylum Bryozoa, the "moss animals"
ectothermic - having an internal body temperature that is dependent on the surrounding temperature. 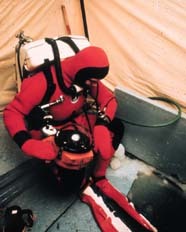 Most aquatic animals are ectotherms; also caled poikilothermal or "cold blooded"
egg case - the leathery case which contains the developing embryo in hagfishes, sharks, rays, skates and chimaeras; also called a "mermaid's purse"
Graphic of sea surface temperatures show El Niño, May 1997.
electron spin resonance - a chronometric dating technique that estimates dates from observation of radioactive atoms trapped in calcite crystals present in a number of materials, such as limestone, coral, shells, teeth, and bones; also called "Electron Paramagnetic Resonance (EPR)"
Encrusting tunicates at Gray's Reef off Sapelo Island, Georgia (Photo: Karen Angle). 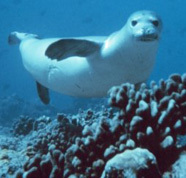 Endangered Species Act (ESA) - an Act of Congress passed in 1966 that establishes a federal program to protect species whose survival is threatened by habitat destruction, overutilization, disease, etc. 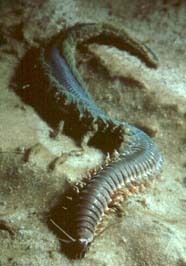 endopodite - in crustaceans, the inner branch, or ramus, of a biramous appendage; the main shaft of that appendage; also called "endopod"
Endoskeleton of a 35-ton, 13-m gray whale on the floor of the Santa Cruz Basin. 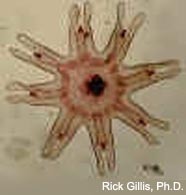 endothermic - an animal that is able to maintain a body temperature that varies only within narrow limits by means of internal mechanisms. 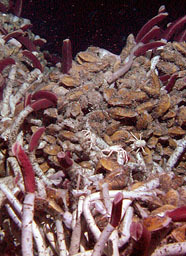 Most birds and mammals are considered endothermic; also called homeothermal or "warm blooded"
endozoochory - the dispersal of plant seeds or spores within the body of an animal, as passing through the animal's digestive system; also called "endochory"
A catastrophic environmental stress-the 1989 grounding of the Exxon Valdez, which spilled an estimated 11 million gallons of crude oil over 1,300 miles of coastline. A human eosinophile. 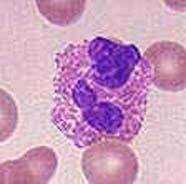 The smaller round cells are red blood cells. 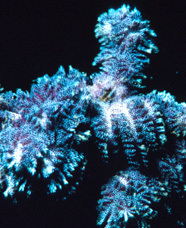 Star coral shedding gametes in an epidemic spawning event. 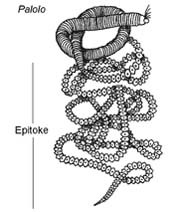 epitoky - a mode of reproduction unique to polychaete worms in which the worm undergoes a partial or entire transition into a pelagic, sexually reproductive form, known as an epitoke. 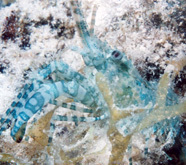 In many cases, epitoky involves loss or degeneration of digestive structures and enhancement of swimming, sensory, and reproductive structures. 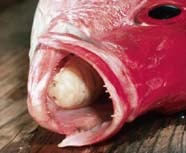 The epitoke is a considered a delicacy in some islands of the South Pacific. 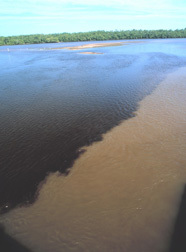 Eutrophic conditions can result in large fish kills, as many fish die from reduced levels of oxygen in the water. 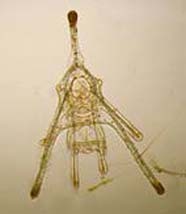 exopodite - in crustaceans, the outer branch, or ramus, of a biramous appendage; also called "exopod"
exozoochory - the dispersal of plant seeds or spores accidentally attached to the outside of an animal's body; also called "epizoochory"
extinct - of a taxon: having no living representatives. Manatees are threatened with extinction from both habitat destruction and direct effects from human encroachment, such as serious wounds from boat propellors. 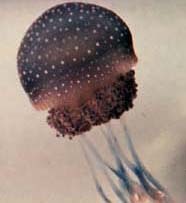 The rounded upper surface of this jellyfish is the exumbrella. 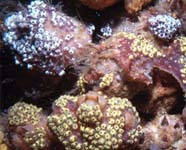 Eyespots of a free-living flatworm, Planaria dugesia.